As anyone who is a fan of books and/or movies knows, the popularity of the Harry Potter series with both kids and adults is something the entertainment industry has long been trying to replicate. Many books have been hailed as “The Next Harry Potter,” in order to get more readers and then viewers if the book becomes a movie. Some of these have failed and some have succeeded, and a few like Twilight have become their own phenomenons. Most people are familiar with the iconic 1939 The Wizard of Oz movie starring Judy Garland. It is a film that made excellent use of color vs. b&w, and introduced “Somewhere Over the Rainbow,” a near spiritual hymn that is deeply entrenched in our collective psyche to this day. What many don’t know is that the author of The Wizard of Oz, Frank L. Baum, wrote thirteen other books about the Land of Oz, some including Dorothy, some not. Over the years, a few of these books have been produced as a cartoon, video, or film, the most recent effort of these was Oz the Great and Powerful directed by Sam Raimi and starring James Franco, Rachel Weisz, Michelle Williams, and Mila Kunis. While it was refreshing to see a new Oz story told, it sadly involved magic, but had none of that film magic that the 1939 movie captured so wonderfully. A big problem with modern fantasy films whether for children or adults is that they evoke no sense of wonder or excitement of either the actual world or of our imaginations. This is perhaps due to our cynicism today, but also much due to the fact that so many film makers don’t want to tell the stories of these excellent works, but their own stories, only slapping the names and settings of better storytellers on their efforts in order to make a profit. It isn’t necessary to faithfully detail every book page to every line in a screenplay, but capturing the spirit of the original work should, I think, be a goal. I saw nothing of Baum’s Oz world in that recent film and thought it was a shame because of all the talent involved in the project. It has been some time since I’ve read the original novel, but the 1939 The Wizard of Oz at least captures Oz even if it didn’t follow the book to the letter. It captured the magic, the danger, and the political intrigue of “the man behind the curtain.” It is a movie much beloved, but not one, I think, for everyone. Let me show another example: Wicked by Gregory Maguire. I have met people who love the story, and some who won’t touch it. It is a story for a specific audience, a story that decidedly won’t appeal to everyone, but to those who desire a deeper understanding of what makes a bad person bad, or a villain a villain. For some, it’s enough to say a character is a villain because, of course evil exists in the world. For others, though, they want to know why, they want a reason either behind the bad actions or behind the label of “evil.” It’s why in the aftermath of mass shootings there is so much focus on the background of the shooter. We think there must be a reason. Sometimes there is and sometimes there isn’t. For those of us who believe there is true evil in the world, no amount of reasons makes any difference, evil is evil. That true evil can’t be corrected by therapy or giving everyone a perfect childhood, well, that’s a hard lesson to learn, and we are a bit loathe to learn that today. We want to blame the gun or the knife, or the possible abuse and/or neglect of the killer, but is the possession of a weapon or any sort of history of suffering really an excuse for the slaughtering of strangers? Aren’t we really, in some form, trying to excuse away the evil in our own hearts? I digress, these all are thoughts best plumbed in an entirely different article. My point is, stories made up to cater to everyone, whether one year to ninety years, whether living in East or West, North or South, often cater to no one. 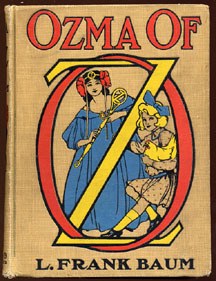 Back on topic: My favorite book in the Oz series has long been Ozma of Oz. Ozma is a great character, not always nice, and one who shows another side of Dorothy. How wonderful it would be for this tale to have a proper big screen treatment. In fact, all of the books in the series offer plenty of plots, magic, characters, and wonder to compromise an entire franchise of films, if only Hollywood, or someone, would step to it. This is a fantasy world that has stood the test of time, and like more modern fantasy such as Harry Potter, offers much social commentary and philosophizing in the process. Lets hope someone redoes Oz into a series. It would be nice 🙂 I for one have not read the book though. Well, Hollywood is fond of rebooting franchises/series, so it’s possible. I just hope they go back to the sprit of the book(s).